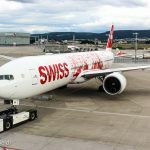 I would like to take up our latest spotting trip at Zurich airport to give you an insight into the SWISS fleet change of last year. 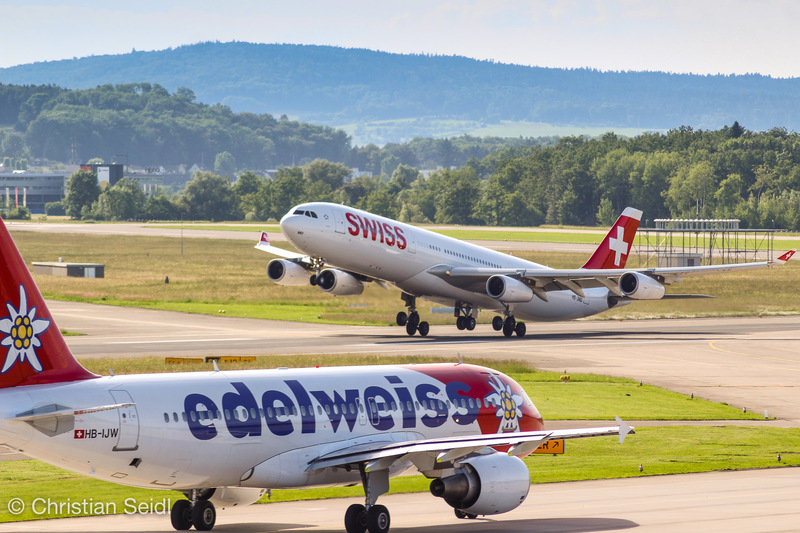 SWISS (LX / SWR) serves 103 destinations in 48 countries from Zurich and Geneva and has a passenger volume of more than 16 million passengers per year. 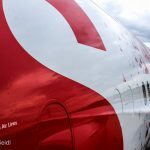 With the established strategy “next generation airline of Switzerland”, a lot has changed within the existing aircraft fleet last year. This is what I want to show you here. 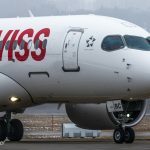 In the recent past, SWISS has taken a major step towards the successive renewal of the fleet and of customer satisfaction with the following big milestones. There was the fleet expansion with Boeing 777-300ER and Bombardier CSeries CS100. Both aircraft types are flothed in in parallel. 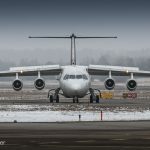 Lufthansa’s daughter, Swiss, currently has a fleet with an average age of 12.5 years and consists of 79 aircrafts, including Airbus A319, A320, A321, A330, A340, BAE RJ 100, as well as the already mentioned new B777-300ER and Bombardier CSeries CS100. 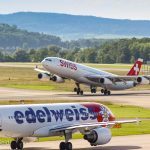 In the past Embraer ERJ 145, McDonnell Douglas MD-11, McDonnell Douglas MD-80, and Saab 2000 were also a part of the Swiss family. 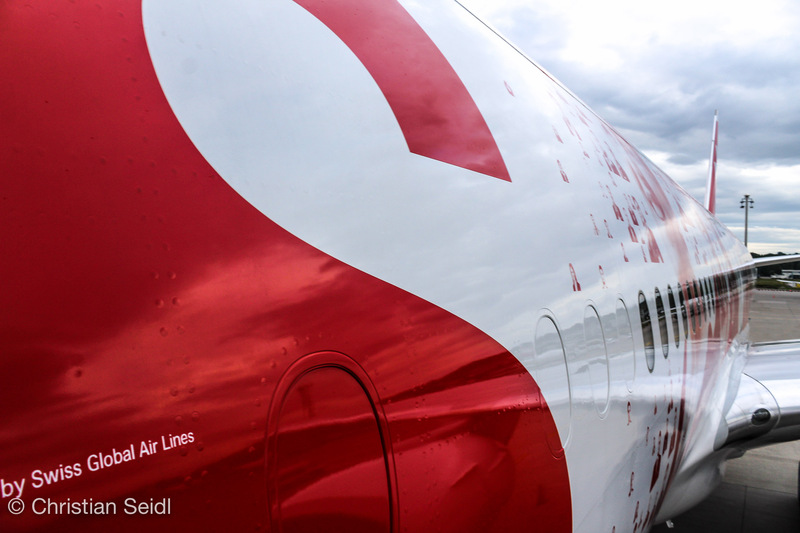 The era of the so-called “Jumbolino” (RJ100 + RJ85) is also coming to an end because of the current fleet renewal. But more on that later. The first big milestone of the fleet renewal was the takeover of the first B777-300ER on January 26th 2016 (Reg. 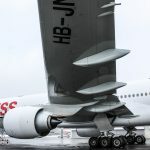 : HB-JNA). It was received solemnly in Zurich on January 29th 2016. 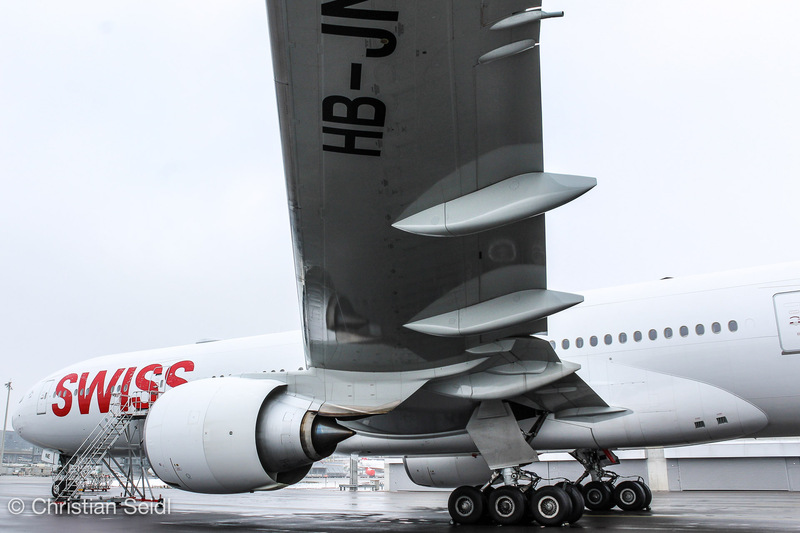 The first commercial flight of HB-JNA took place on February 21st 2016 from Zurich to New York JFK. 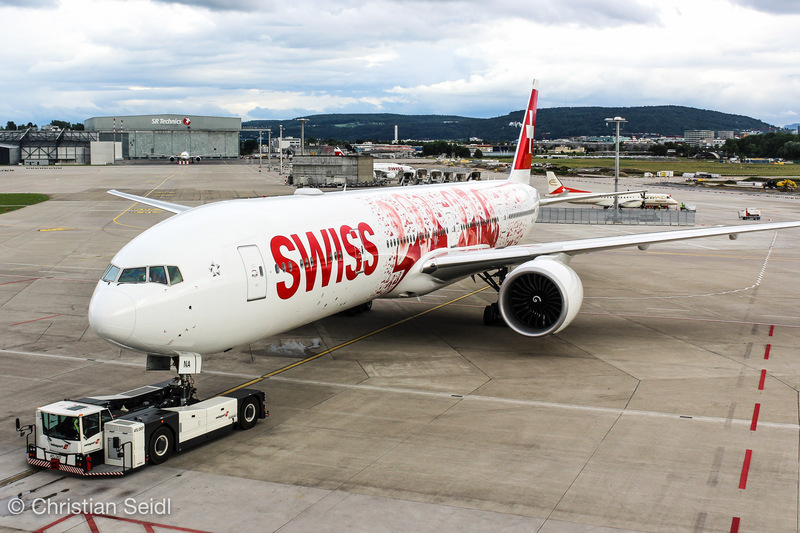 This first Boeing 777-300ER of Swiss was designed in the “Faces of SWISS” livery on the fuselage which shows about 2,500 faces of SWISS employees. 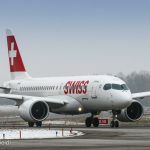 The modern aircrafts of this type that are operated by Swiss have a configuration of 340 seats, from which 8 are in the First Class, 62 in the Buissnes Class and 270 in the Economy class. Another innovation, a wireless Internet offer on board which will be complemented by roaming telephony after a test phase, is now available in all three classes for the first time. The WIFI offers range from 20 MB for 9 CHF to 120 MB for 39 CHF. In the first class you get 50 MB of data usage free of charge. 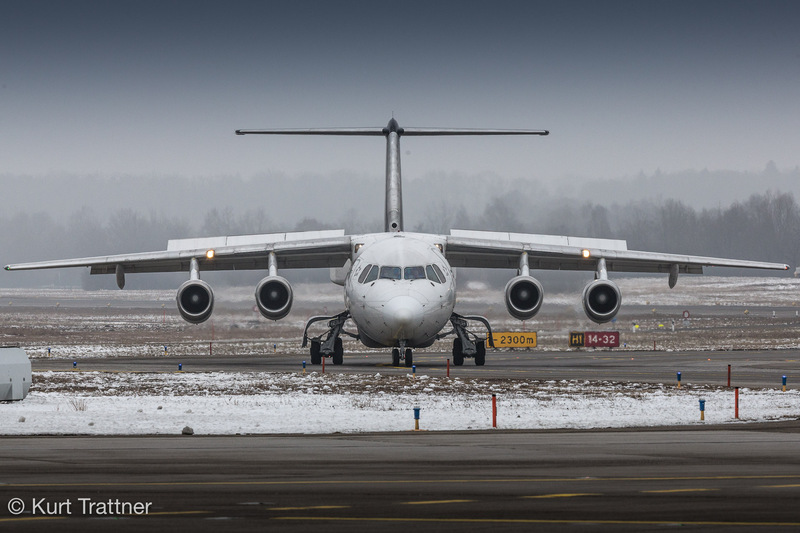 The tripple seven replaces parts of the existing A340-300 long-distance fleet, which has an average age of 14.6 years. At the moment, 10 of the originally 15 aircrafts of this type are still in service. The five remaining A340-300s will be equipped with a new cabin in all three classes, including a new on-board entertainment system and the new WIFI system. The 777 is primarily used for connections to Los Angeles, San Francisco, Miami, Hong Kong, Bangkok, Sao Paulo and Tel Aviv. But there are also some short distance flights on the schedule like Vienna and Hanover. These flights are mainly for pilot trainings. HB-JNF was delivered on July 22nd 2016. The total fleet strength of the tripple seven is supposed to be 10. The last of these planes will be delivered in 2018. 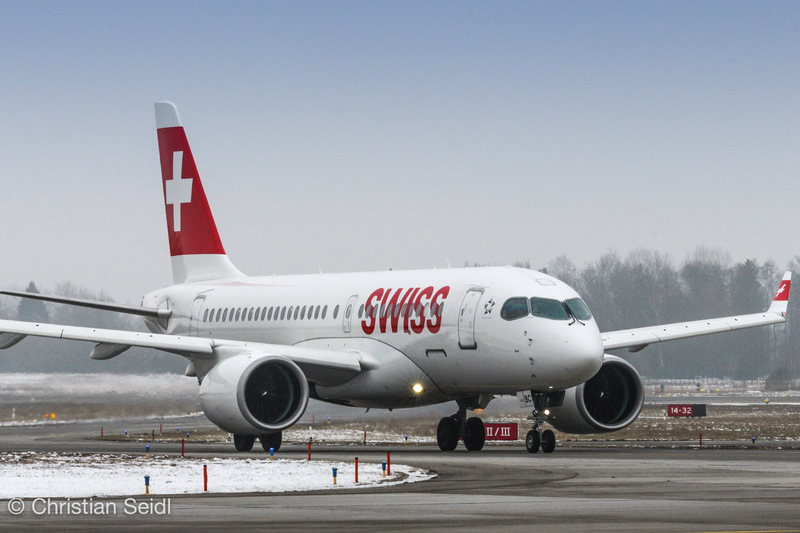 A further highlight was the introduction of the Bombardier CSeries CS100. 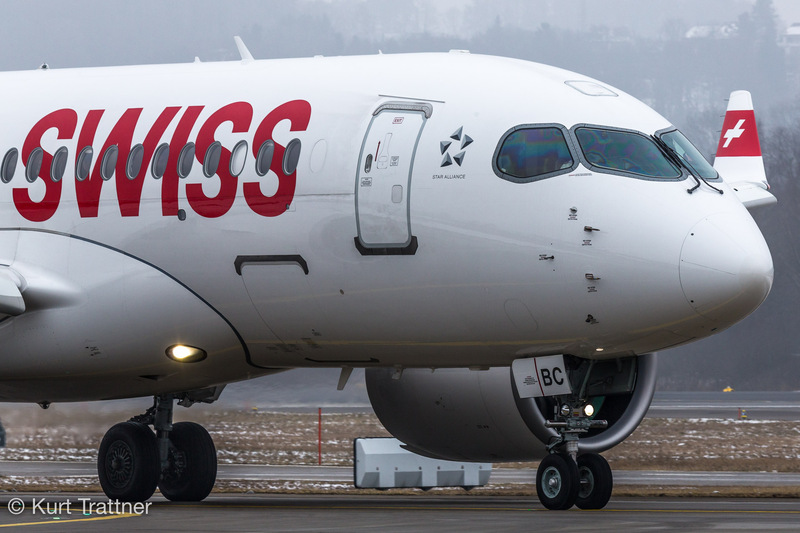 SWISS is the first customer of this modern short- and medium-range aircraft and they can be proud of it. The first machine was delivered on June 28th 2016 (Reg. : HB-JBA, Name: “Kanton Zürich”) and was welcomed to the Swiss family on July 1st 2016 in Zurich with a special flight together with a Lockheed Super Constellation. The first commercial flight took place on July 15th 2016 to Paris CDG. The current destinations are: Manchester, Prague, Budapest, Warsaw, Brussels, Nice, Stuttgart, Hannover, Milan, Florence, Bucharest, London. At the moment five aircrafts has been delivered. The newest one has the registration HB-JBE and was delivered on 21st of December 2016. 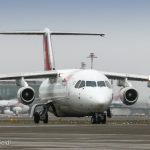 In total, the future CS100 fleet will consist of 30 aircrafts and will replace the British Aerospace BAe 146 / Avro RJ 100 “Jumbolino” fleet by July 2017. In the fleet there are eight of the originally 25 Jumbolinos with an average age of 18 years. 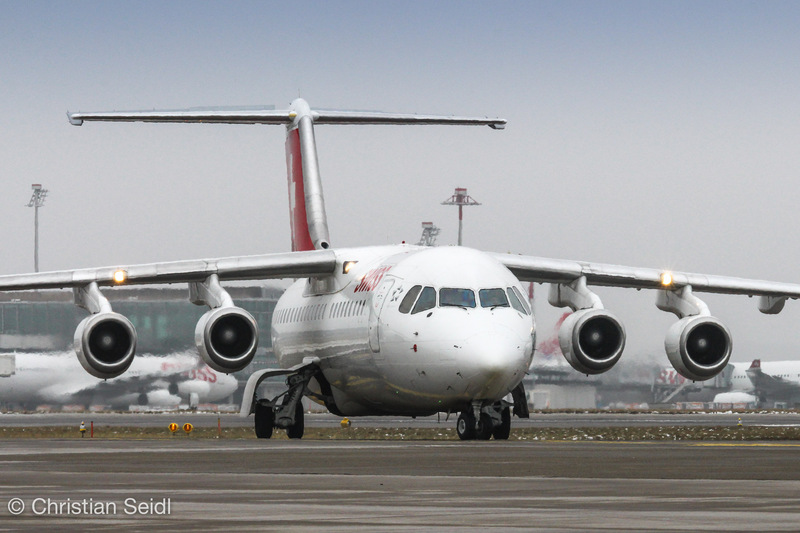 The oldest one is the Avro RJ100 with the registration HB-IXO which is even 20.7 years old. The bottom line is, that we can enjoy many innovations in the future, but many aviation enthusiasts will always remember the small, industrious and incomparable Jumbolino and will thank him for the faithful service he has given to the fleet. Get a picture and experience Swiss close up.